Nikon's eyeglasses division is very excited about touting the brand's rich history of iconic cameras—so excited, in fact, the group didn't even notice the retro-styled camera featured in one of its ads is actually made by a competitor. Photographer David McDonald originally noticed the error in an ad he came across in Belfast, Northern Ireland. "I see our heritage through Nikon spectacle lenses," the copy reads. 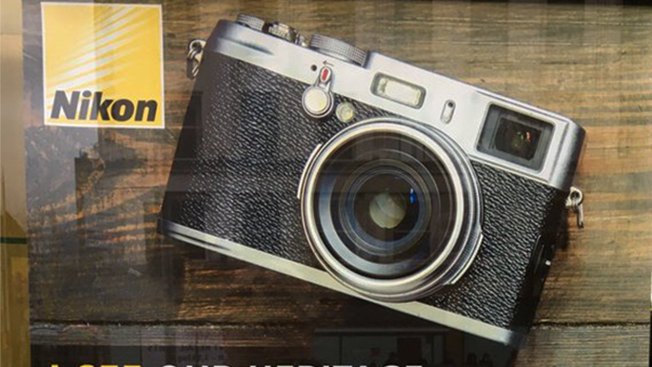 Unfortunately, the camera shown isn't a Nikon, but—according to the experts at Petapixel—a lightly Photoshopped Fujifilm X100. This isn't the first Photoshop fail Nikon has fallen victim to. The brand recently praised a photographer (and awarded him a Nikon trolley bag) for capturing a photo of an airplane perfectly framed by a ladder and vertical crawlspace. The image, however, was clearly Photoshopped, which the design crowd immediately pointed out and mocked with a gleeful series of equally ridiculous images. Hey, who's to say what's real and what's not? Sometimes you just happen to be in the right place at the right time to catch a battle between X-Wings and TIE Fighters.